The short version: Hell Comes With Wood Paneled Doors is a humorous coming-of-age story about a family traveling cross country in a possessed station wagon. 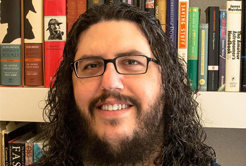 The little bit longer version: When Michael O’Brien and his father, James, buy a new car just in time for the family’s summer vacation, James signs over more than the title to his old AMC Gremlin in his rush to buy the brand new Inferno station wagon. Joining them on the trip are Michael’s creepy younger siblings, Elvis and Olivia; his overbearing mother, Mary, and her pet Chihuahua, Lucky; his backwoods aunt, Margie; and the cremated remains of his grandmother, June, whose dying wish was to have her ashes scattered in the Grand Canyon. Can the O’Briens pull together to defeat the possessed station wagon, or will the forces of evil destroy the family in the process? Find out in this humorous coming-of-age story. 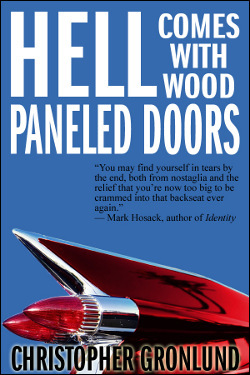 You can purchase Hell Comes With Wood Paneled Doors from Amazon or from Barnes and Noble. I’d hope, in exchange for a free novel, that you’d be okay being added to a newsletter I put out (usually never more than once a month).